This deliciously creepy and loving tribute to the master of modern horror features riveting illustrated stories of his wicked progeny. In the century since the master of horror, H. P. Lovecraft, published his first story, the monstrosities that crawled out of his brain have become legend: the massive, tentacled Cthulhu, who lurks beneath the sea waiting for his moment to rise; the demon Sultan Azathoth, who lies babbling at the center of the universe, mad beyond imagining; the Deep Ones, who come to shore to breed with mortal men; and the unspeakably-evil Hastur, whose very name brings death. These creatures have been the nightmarish fuel for generations of horror writers, and the inspiration for some of their greatest works. 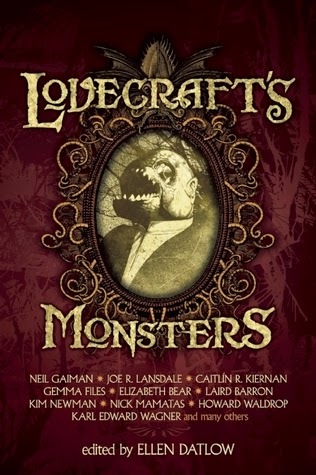 This impressive anthology celebrates Lovecraft's most famous beasts in all their grotesque glory, with each story a gripping new take on a classic mythos creature and affectionately accompanied by an illuminating illustration. Within these accursed pages something unnatural slouches from the sea into an all-night diner to meet the foolish young woman waiting for him, while the Hounds of Tindalos struggle to survive trapped in human bodies, haunting pool halls for men they can lure into the dark. Strange, haunting, and undeniably monstrous, this is Lovecraft as you have never seen him before. Lovecraft's Monsters is an anthology of 16 short stories and 2 poems that are inspired by HP Lovecraft's mythos. These stories and poems have been published previously in different magazines and collections. I must be honest and say that I have not read any of HP Lovecraft's work. The reason that I really wanted to read this collection was that I love playing Lovecraft-themed games like Elder Sign and Arkham Horror. I love playing against the Ancient Ones like Cthulhu, and I thought getting a feel of these characters outside of a board game would be perfect. I also figured that these stories would help give color to future games of Elder Sign and Arkham Horror. Yes, I read to improve my gaming experience. I am geeky like that. This anthology was a bit of a mixed bag for me. I really enjoyed some of the stories (e.g., Neil Gaiman, Elizabeth Bear, and Nadia Bulkin's stories), while other stories I just tolerated. I wonder if I was more familiar with Lovecraft's work whether I would have enjoyed some of the stories more. Although I did not enjoy every story and poem in the book, I did recognize many Lovecraft monsters and locations. I felt like I was playing "Where's Lovecraft?," and I loved it. Reading this collection made me appreciate Lovecraft's universe and the true horror that the townsfolk most be experiencing within the games of Elder Sign and Arkham Horror. I realize that this must sound cheesy, but it is true. Reading these stories gave me a better understanding of the Lovecraft Mythos that has invaded our pop culture. Cthulhu is not a cute monster and Arkham would not be were you would want to settle down even if you are a fan of the supernatural. Lovecraft's universe is a terrifying place to live. Lovecraft's Monsters is truly a collection of horror stories and poems. This is not a collection of gory, bloody, and violent stories. No, this book, in a sense, is much scarier. Many of these stories are horrific in the sense that the characters are not going to find their happy endings and they are helpless to stop the evil from happening. I found myself gasping at times when I realized how desperate the situation was for some of these characters and how little anyone could do to help them. Just in case you are wondering, I now really want to read more horror and even some Lovecraft. Overall, I liked reading the stories in this anthology. A fan of Lovecraft or the games inspired by his works will find at least a handful of stories to his or her liking. If you are a classic horror fan (e.g., Dracula, The Haunting of Hill House, and Frankenstein), you too may enjoy this collection.